My friend Holly introduced me to this site,Twilight Tuesday Inspiration Challenge. After blowing off peoples opinions of the Twilight book series I decided to read them for myself one day when my daughter brought home the first book. Totally not my type of book but what can I say, I was hooked! Team Edward all the way :) I'm always looking for challenges that get me thinking outside of my comfort zone so I figured I'd give this one a shot! I also combined it with this weeks color challenge over at Splitcoast. 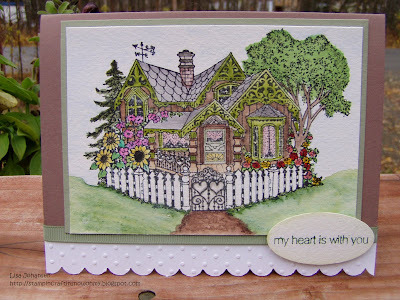 The challenge was to create a craft based on one of the homes discussed in the series, or just what home means to you. As soon as I read the challenge I knew what I wanted to do. I've had this stamp since about 1993 and I thought it would be perfect for representing Edward and Bellas cottage in the woods, which was given to them as a wedding present. I was going for something that would blend in with its surroundings and not stand out. Don't forget to link up over there... I love it!!! That stamp is really pretty.. You did an awesome job!! Holy cow, this is gorgeous! That house stamp is beautiful. I've never seen anything like that and you did a beautiful job coloring it all. WOW. What a gorgeous card!! 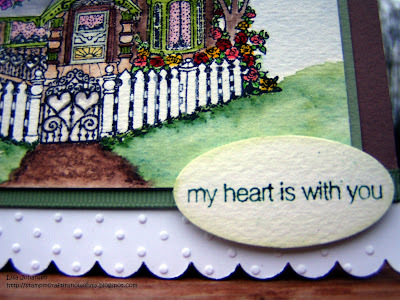 I love how you embossed the scallop edging. That looks really nice. And I know you spent a lot of time coloring! And with a blender and aqua painter no less! You did a beautiful job on this! Thank you so much for playing in our challenge! TEAM EDWARD!!! WHOOT WHOOT!! Wow! What a beautiful card! Welcome to the crazy world of Twilighters! :) So glad you joined us - hope to see you back soon! This is such a gorgeous card. The stamp is perfect and you did a brilliant job with the colors. Go Team Edward! So glad you found our challenge and thanks for playing along. Hope to see you there again soon! Oh wow! This is awesome! I'm sorry I didn't get over here sooner. But I'm so glad I stopped by! What a beautiful card! Thanks for playing along! Thank you everyone! I really had fun with my first Twilight challenge! Now I need to make some time to work on the latest challenges!